When comparing 25- to 34-year-olds of today with those in 1980, big differences emerge. Millennials in Seattle are more likely to have high-paying jobs than their contemporaries in the 1980s, but they're also likely saddled with more student loan debt and housing costs are much higher. Imagine a young family house-hunting in the Seattle area and the most they could afford was $230,000. It would be funny if it weren’t so sad. But think back to 1980, if you’re old enough to remember. That same young family would have their pick of houses, because $230,000 was roughly the average value of a single-family home here, in today’s dollars (or about $75,000 in 1980 dollars, before adjusting for inflation). Yes, it’s a different, and often rougher, world for millennials than it was for earlier generations of young adults in the U.S.
That reality is made crystal clear in a series of charts posted to the national news website Axios last week. A handful of line graphs using census data and other sources show how incomes for people age 25 to 34 haven’t budged, once you adjust for inflation. Home-ownership rates have plummeted compared with their parents’ generation. While many more young people are college educated today, tuition has gone through the roof, which means they’re often starting out in life swimming in debt. Looking at these charts, I wondered how closely the Seattle area parallels these trends. So I pulled together census data for 25- to 34-year-olds in King, Pierce and Snohomish counties, comparing 1980 with 2016, the most recent year for which the data is available. In many ways, we mirror what’s happened nationally — but in one important way, we’re doing better: Seattle-area millennials are more likely to have a high-paying job than their contemporaries back in 1980. Personal income has seen significant growth at the top. In 1980, 11 percent of people in this age group took home $75,000 or more in today’s dollars (or about $25,000 or more in 1980 dollars). In 2016, more than 16 percent did. That makes sense when you look at some of the changes to the list of the most common jobs held by 25- to 34-year-olds in this area since 1980. Gone are secretaries, delivery truck drivers, waiters and waitresses and carpenters. Now we’ve got software developers firmly in the No. 1 spot — and the average pay is just about $100,000. Computer scientists made the top-10 list, too. So it’s not surprising that the percentage of millennials who’ve completed at least four years of college is much higher than it was for young adults in 1980, which is true nationally as well. 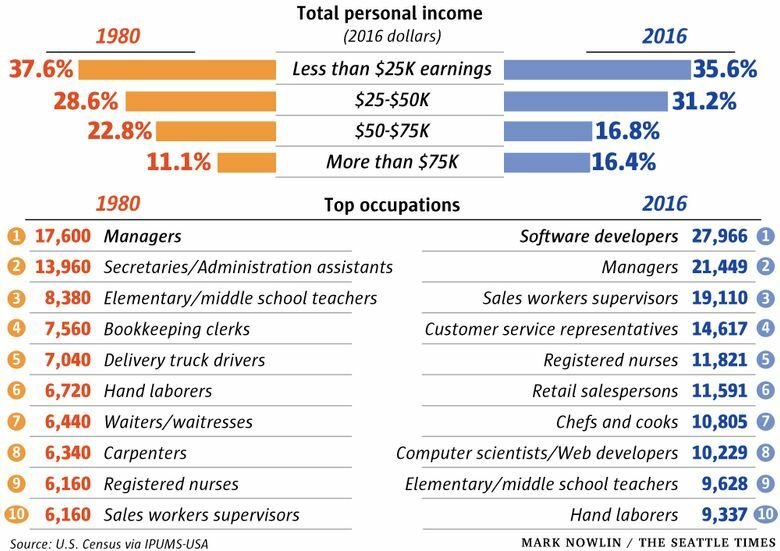 To be sure, there are still lower-paying jobs on the list of top occupations, including a couple that weren’t there in 1980, like retail salespeople and chefs and cooks. It should also be noted that about the same percentage of young people are in the lowest income bracket now as back then. 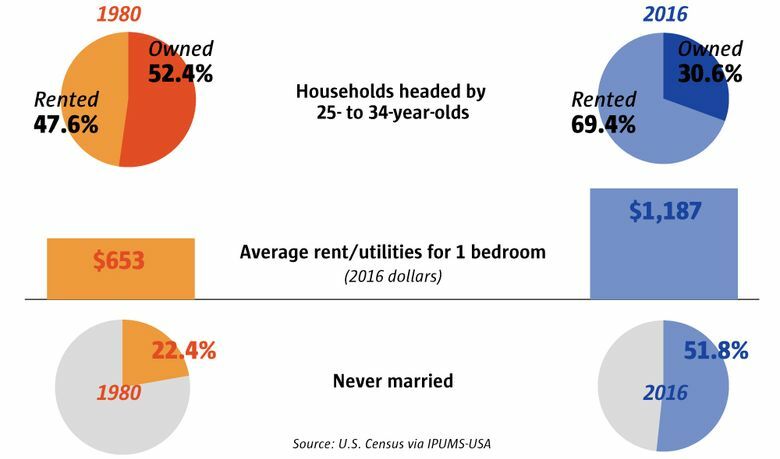 But even if many Seattle-area millennials are making good money, they’re still facing daunting housing costs. In 1980, the average rent paid for a one-bedroom, including utilities, was just $653 — and yes, that’s adjusted for inflation. In 2016, that expense is nearly double. Home prices are even crazier, which is part of the reason that the percentage of young renters has skyrocketed. It’s hard to believe, but in 1980 the majority (52 percent) of households headed by a 25- to 34-year-old in the three-county area owned their home. Now it’s down to about 30 percent. Not only have home prices far outpaced the rate of inflation, but how do you save for a down payment when you’re saddled with college debt? Tuition costs have gone through the roof in the past 40 years: For example, in-state tuition for an undergrad at the University of Washington has gone up five-fold, after adjusting for inflation. Young people are waiting longer to get married now, both in our region and nationally, meaning fewer dual-income households. 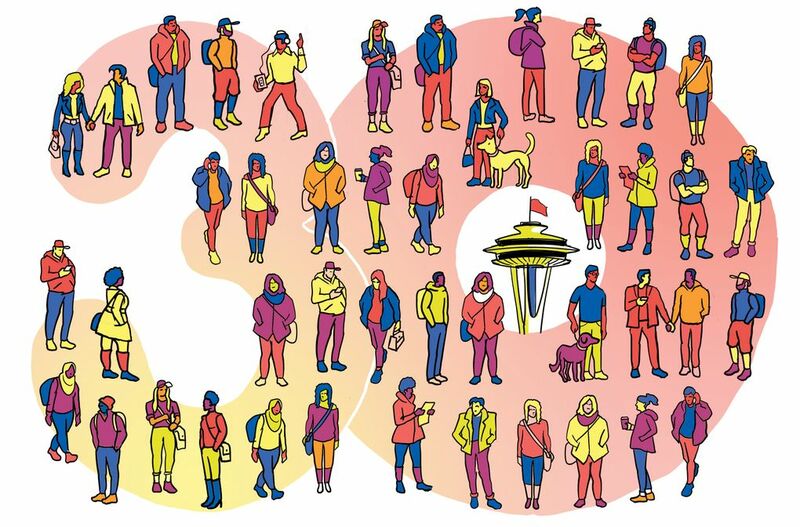 Today, the slight majority (52 percent) of young folks in the Seattle area are never-married singles — back in 1980, it was just 22 percent. Beyond the economic hardships facing young people today, the region is transforming in other ways. Over the past 40 years, this age group has become much more diverse. In the three-county area, the share of the population 25 to 34 that is white has dropped from 88 percent in 1980 to 61 percent in 2016. They’re also more international. In 1980, just one out of 13 young adults in the Seattle area was born outside the U.S. Today, it’s one of four.